This is a book for those curious about where the Internet comes from. I don’t mean, where are the servers, or what has the modem done with my document, but, where does the information come from, and go to? When I press Send in Belgium, and Juliane gets the email a few seconds later in Australia, how does that work? A transmission takes 168 milliseconds on the fastest routes, but where are the routes, and who controls them? Nicole Starosielski is a communications historian and network archaeologist. When she’s at the seaside she looks at the ground, not at the sea. She’s looking for the places where the world’s undersea cables carrying the fibre-optic wires go into and out of the sea, because these carry 99% of the world’s Internet traffic. 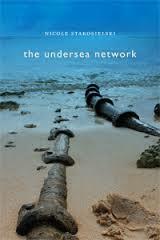 There are 223 international undersea cable systems and hardly any are backed up by satellite. A very small number of companies control the world’s Internet traffic, and their knowledge of undersea topography and currents is crucial for knowing where not to lay a new cable. If the networks broke down, the Internet would be confined to the continents, unable to cross the oceans. Considering that most Internet users rely on wifi, or wireless Internet, to transmit their messages, the fact that we cannot do without physical wires to transmit those bytes is downright paradoxical. ‘Our seemingly wireless lives are predicated on a mess of tangled wires’. When cables first snaked across the ocean floor in the mid-nineteenth century they carried telegraph signals (and they also standardised longitude for the first time). 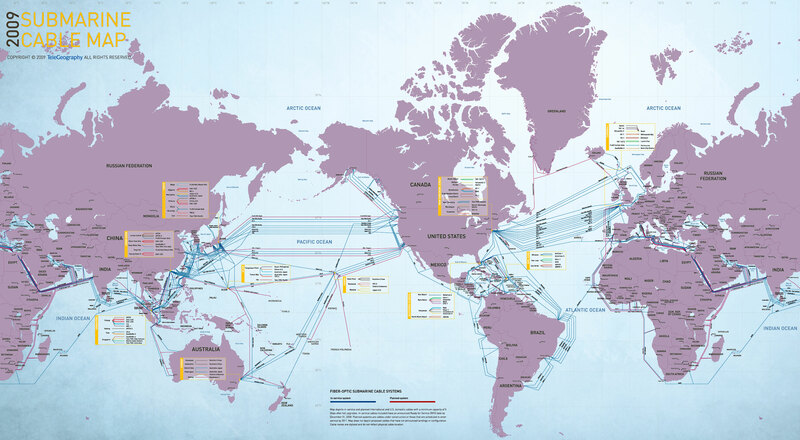 When they were replaced by fibre-optic cables in the 1980s, the routes were largely unchanged, so the routes dictated by the British Empire’s communication needs still dictate the web of physical communications links under the seas. Of course, much of this was predetermined by undersea topography: the Marianas Trench being one of the big obstacles to Atlantic cable traffic, since the cable has to go round, not over it. Cables are at their most protected when they’re lying snug under the mud on the ocean floor: nothing snags them there. Cables prefer neglect, and can lie undisturbed for decades working perfectly. But when cables are anywhere near human traffic, they’re liable to be broken, hauled up, wrenched apart or simply snipped. A single traffic-carrying wire is only a couple of centimetres in diameter, after all. Starosielski has some excellent anecdotes illustrating the fragility of the Internet when faced with an ignorant person wielding a hoe. In 2011 a woman in Georgia stopped most of the Internet traffic in Armenia when she dug up two of its three fibre-optic lines looking for scrap metal. The chairman of Arctic Fibre says, resignedly, that 60% of his cable breaks are from ship anchors and trawling machinery. Land repairs are relatively easy, but undersea repair teams need very specialised ships, they might need permits to go to the right area to work, and they might not want to go there anyway if it’s in a war zone, or irradiated, as was the case after the Japanese tsunami. Crocodile sharks and whitetips have also been known to try chomping the wires. 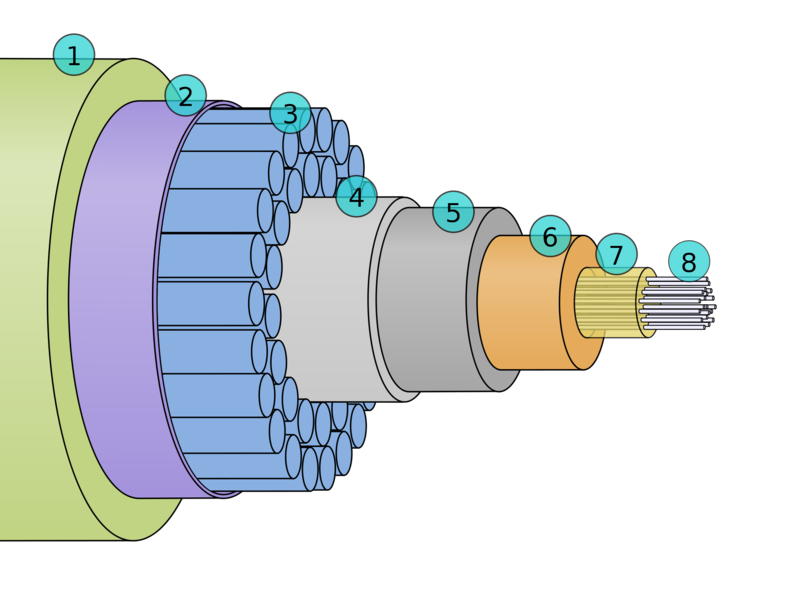 Cable companies protect their lines by insulating them from human activity: by camouflage, by relative invisibility, with heavy militarised security, or by obscurity. Since the public zone is where risks of damage are highest, there are multiple entry points on the shoreline that all join up, some way below the water, into one or two fat cables that snake across the ocean in peace and quiet. Starosielski writes about the human connections to the entry points into and out of the sea, and the importance of islands in routing mainland traffic to other mainlands. She goes around the edges of Australia, visits obscure but geographically crucial islands like Guam and Yap, and takes a lot of photos of anonymous buildings on the coastal edges. My favourite cable anecdote is of how old cable coils are being reused to build artificial reefs up to 300 miles out into the ocean off Maryland, bringing new wildlife and fishing to the area. This is a thorough and well-narrated account, bringing complicated questions to the surface. Highly recommended.